One of the more-popular interior window treatment options to come along in recent years has been thermal draperies. In a cold-weather state, such as New York, one might think that thermal draperies or curtains are only useful during the winter months, when they will protect the rooms from the chilly air emanating from the windows. Most homeowners only put thermal draperies up in late Fall once the chilly air arrives. They come in different weights and add a protective layer to guard against the cold, but did you know they are also useful for shielding windows from the hot sun as well? Thermal draperies also are good for masking noise if you are a light sleeper or a shift worker or if you have welcomed a new baby into the family. Although thermal draperies help thwart the chilly air, it is better to stop the cold in its tracks by adding exterior window protection. It is good to be proactive about preserving as much warmth as possible in each of your rooms, to help stave off the shivers and lower your energy bill. 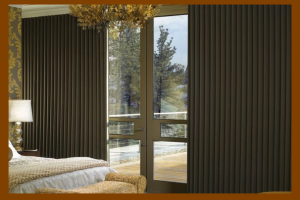 As mentioned above, a better way of combating that cold air, is through the use of exterior window treatments which work from the outside, adding an extra layer of warmth to your windows. If you still want to add the interior window treatments, go right ahead, but take a look at these exterior options first. You can peruse and study them on the internet or speak with a contractor or visit a showroom that specializes in exterior window treatments in New York. Exterior rolling blinds or rolling shutters – The beauty of rolling blinds or rolling shutters (the terms are often used interchangeably) is that they are made of durable materials, which are impervious to such winter woes as snow, freezing rain, hail and ice. They are vertical blinds, tailor made to fit each individual window in your home. Once installed, they are permanent fixtures and are generally made out of aluminum, but may be made out of wood, steel or vinyl as well. They are mounted adjacent to the window inside the house and controlled inside as well. The blinds may be partially raised to permit daylight or air to enter the room, as well as controlled to be completely shut down, yet allow slits to permit ventilation into the room(s) as well. You may allow ventilation into a room when you are away for the day and rest assured that no one can enter the house through a window from the outside as it is 100% secure. While rolling shutters, when pulled completely down, will darken a room entirely with no discernible light whatsoever, you also will know that the cold air is being kept away from the window(s) and from entering your home. Likewise, in the summer months, these heavy blinds will not allow the sun to come into the home, unless raised, thus providing additional energy savings in the summer months as well. Traditional shutters – There are two types of shutters: interior and exterior. While each type is effective at reducing Winter heat loss and Summer’s heat gain, exterior shutters are much heavier and built to withstand the Winter’s brutal temps and wind chills. Interior shutters are basically more for decorative purposes, but they do, of course, add an extra layer of protection at the window area to keep the chilly air at bay. Exterior shutters, depending on the style and manufacturer, generally have louvers or slats, but may also be insulated or have certain properties that include pop-in panels. They are constructed so as to provide an air-tight seal where the shutters meet the windows. Awnings – While awnings are awesome in the Summer months for keeping out the scorching heat, the newer styles of awnings are made of better insulating materials and are well ventilated so also may be used in the chilly months, just before snow sets in, to give a moderate amount of protection to windows by virtue of the overhang. Once the snow arrives, awnings should be lowered to prevent the heavy snow from settling on the awning top and potentially crashing through. Exterior covers with special insulating properties – Exterior window treatments such as insulated shutters and panels, and window quilts serve as both coverings and insulators. Insulated panels – Insulated window panels or pop-in shutters can be made of rigid foam insulation which is applied to the interior of a window. These are foam panels, approximately one-half inch to one-inch thick, relatively inexpensive, and help prevent Winter heat loss and solar heat gain like other coverings. Window quilts – These are insulating shades made from a quilted material that run on a track along your window. The use of window quilts prevents Winter heat loss and Summer heat gain by forming a “dead” air space between the quilt and the window which allows for better insulation. While window quilts seem like an easy-breezy way to lower your utility bill, they do require a bit more headache and hassle at the outset. Unlike the installation of any of the newer types of energy-saving windows, window quilts require new reconstruction or modification of your home. So, in balance, window quilts are less expensive, easier to install and provide a much-higher efficiency in return, as opposed to new energy-efficient windows. As opposed to storm windows, a window quilt, when fully lowered, provides ventilation, yet reflects the hot Summer sun and seals out the brutal Winter winds and cold temps, thus providing year-round excellent insulating properties. A last added bonus is that they provide total privacy. In general, any traditional type of exterior window coverings such as awnings, exterior blinds, and exterior shutters are much more efficient in the Summer months, since their primary purpose is to stop the sun in its tracks right as it enters the window. In the Winter months, in a cold-weather state such as New York, your best option for keeping out the cold is utilizing interior window coverings as well as exterior, which will work toward a warmer household and splitting the energy bill in two. It couldn’t hurt to try, nor to stop in at a showroom which specializes in exterior window treatments and see what ways you can aim for a less-shivery Winter this year.